This rich, moreish dessert is super easy to make and the perfect ending to a special meal. Prepare the cake at least one hour in advance of serving. Kept in an airtight container, it will last for a couple of days. Line a 23cm loose-bottomed flan tin with the biscuits. Drizzle with the amaretto liqueur and set aside. Melt the butter and chocolate in a bain-marie. Separate the eggs. Whisk the egg whites to soft peaks. Cream together the sugar, cornflour and eggs yolks. Add the melted chocolate and butter to the creamed sugar and egg mixture and beat until combined. Fold the egg whites into the chocolate mixture with a metal spoon. Pour the mixture over the biscuits and bake for 45 minutes or until firm to the touch. Take the tin out of the oven and leave to cool for 5 minutes. 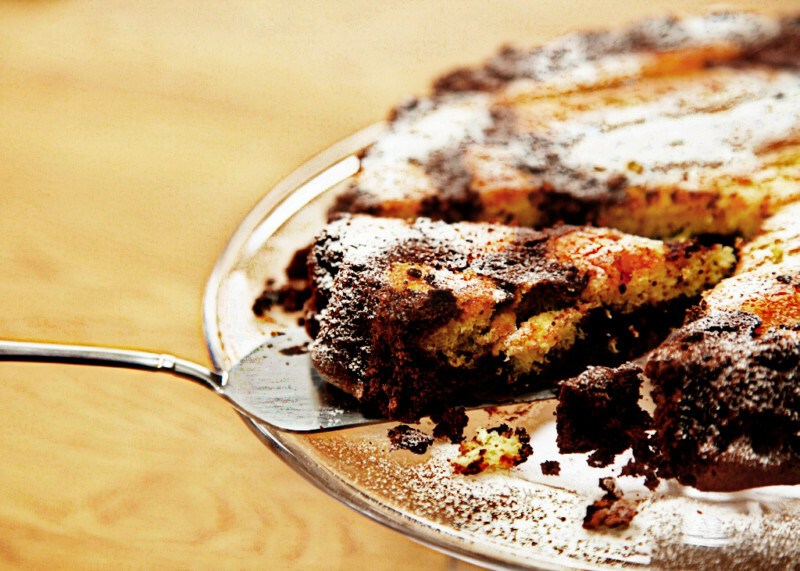 Turn the cake on to a serving dish with the savoiardi biscuits on top and allow to rest for an hour before serving. Dust with icing sugar. Serve with cream.